First Appearance: Supernatural Thrillers #5 (Aug. 1973): "The Living Mummy!" 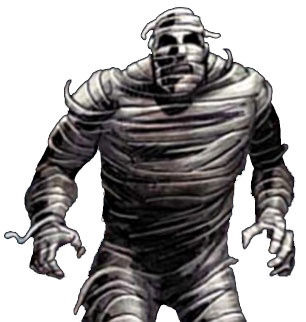 N'Kantu, the man who would become the "Living Mummy," was originally born approximately 3000 years ago in the nation of Swarills on the African continent. Captain America (vol. 1) #361 (Early Nov. 1989): "Bloodstone, Part Five: Lair of the Living Mummy"
Marvel Preview #12 (Fall 1977): "The Haunt of Horror"